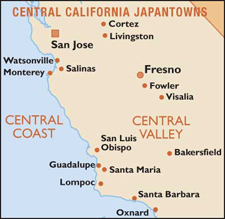 The Japantown Atlas maps nearly two dozen communities in California where Japanese Americans lived and worked prior to World War II. Drawing from historic maps, business directories, and photos, we show a variety of Japantowns as they existed in 1940. Our project both memorializes the Issei (first generation Japanese immigrants) in their first 20-50 years in America - the businesses, churches and schools they established - and documents the hometowns that 120,000 Americans of Japanese ancestry were forced to leave behind during their incarceration in "Assembly Centers" and "Internment Camps" during World War II (1942-1946). How big were California's Japantowns? In what part of town were they located? If you walked down this street in 1940, what would you have seen? a. Detailed maps: Buildings are traced from Sanborn maps, with uses shown by color shading (red for businesses, green for residential, yellow for community). 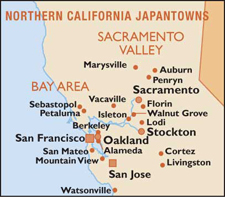 Japanese American businesses are named in purple type.This sort of map lends itself to densely settled areas such as Little Tokyo, San Francisco, San Jose and Marysville. It's a good format for seeing the structure of the town or city, and answering questions about particular buildings, but is labor-intensive, and it's a "mole-hill view". b. Overview maps: For a broader view, we trace streets from USGS quads and road maps, then zoom in, adding businesses and landmarks. Businesses are shown with dots and named in purple type, with nurseries in green. The dot's fill color indicates whether the building that housed the business is extant in 2007, or if it's vanished, or not yet documented. This format is best for showing how JA businesses were distributed in an entire town or neighborhood, and for showing widely spaced businesses (farming areas, downtown Berkeley). I usually have the Sanborn maps at my elbow even when drawing overview maps; in some cases I go back and map the busiest areas in detail (such as Oakland Chinatown or downtown Pasadena). We hope these two somewhat different styles are complementary enough that you'll forgive any inconsistencies between them. Maps are usually shown as JPEGs. They are big, coarse, and take a long time to download, but they're the best format for most browsers. Have patience! If you have a fast internet connection and can open PDFs, the PDF format has crisper small type, and you can zoom in or out for a better look. Several PDFs are posted so far. Look for links on the individual map pages, or on our PDF list. Drop us a line if you can't find what you're looking for. See Links page for info on laserprint copies (at cost of reproduction and postage) and fair use policy. 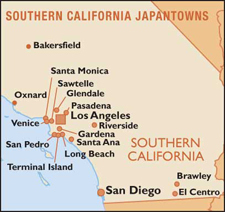 Most of the 2 dozen or so Japantowns on our list are among the 43+ places that our sister project, Preserving California's Japantowns is documenting with photos, oral histories, etc. Their focus is on documenting existing landmarks and remembrances (a worthy cause!) and you'll find good photos and history on their website. Japantown Atlas tends toward mapping cities and towns, because the Sanborn maps and directories show them best. We've tried to pick a good mix of urban centers, fishing villages, and farm towns; north and south; inland and coastal. One resource that escapes largely unrepresented by our maps is Japanese American farms – they are plentiful in the directory listings, but most had rural federal delivery (RFD) addresses or post office boxes and were not shown on Sanborn maps, so they are hard to locate with the records we most rely on. b. Sanborn Insurance Map Co. maps (various dates, 1910-'50, interpreted for 1940). e. Field visits to selected towns. If you have any stories, maps, or family photos you'd be interested in sharing about your town, or have questions about a particular place, or anything to do with our project, please email us or drop us a line. San Luis Obispo, Santa Barbara, Fresno, Guadalupe, Oxnard, and Watsonville. Los Angeles (intro): Little Tokyo, Terminal Island, San Pedro, Boyle Heights, Sawtelle; Pasadena, Gardena, Orange County, and San Diego. For your convenience, the Links page has a list of Japantowns by Type (existing/urban/suburban, farm towns, etc.) linking to the same pages as above. To make more sense of the maps, we're adding a fewe photos of Japantowns we've visited in the past year. 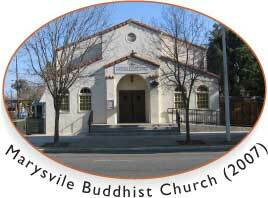 As of 1/8/08, we've added photos for Fresno, Guadalupe, Walnut Grove, San Jose, and Marysville. Photos are the bottom of each page. 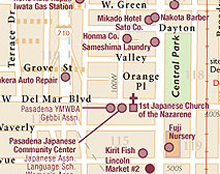 Maps of our 24 California Japantowns, PCJ's 43 Japantowns, and an Assembly Centers and Internment Camps map were added 4/08. Japantown Atlas Project is partly funded by the California State Library: California Civil Liberties Public Education Project (CCLPEP) in 2006-2007. 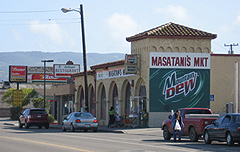 Advisors include Donna Graves, Gail Dubrow, and Jill Shiraki of the Preserving California's Japantowns project, Rosalyn Tonai of the National Japanese American Historical Society, and Professor Art Hansen, CSU Fullerton. 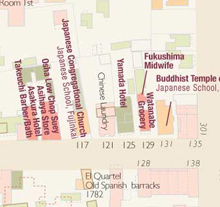 We are adding links from our Japantown maps to the corresponding history pages on Preserving California's Japantowns's website, and vice versa. We will do our best to keep these links current as pages on each site are posted. Drop us a line if you find something missing or not working properly and we'll do what we can to fix it.